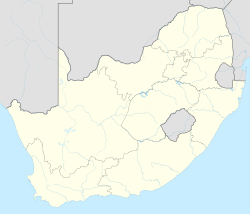 Bergville is a small town situated in the foothills of the Drakensberg mountains, KwaZulu-Natal, South Africa. It was established as Bergville Mountain Village in 1897 and is now the commercial centre for a 2,500 km² dairy and cattle ranching area. A blockhouse was built by the British soldiers in the town during the Second Boer War. Bergville is equidistant from Johannesburg and Durban and is also known as the gateway to the Northern Drakensberg holiday resorts. It lies on Route R74 which is a more scenic alternative to the N3 Toll Road. This route takes one via the Oliviershoek Pass, traditionally used to access the Drakensberg, from Johannesburg. Bergville is easiest reached from Durban by turning off the N3 after Estcourt, joining the R74 through Winterton towards the mountain. Zāhid Jadwat - News24 columnist and writer. Wikimedia Commons has media related to Bergville. ^ a b c d e "Sub Place Bergville". Census 2011. 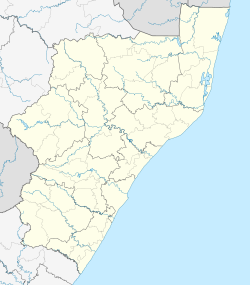 This KwaZulu-Natal location article is a stub. You can help Wikipedia by expanding it. This page was last edited on 22 March 2019, at 21:04 (UTC).